A pilgrim information point in the chapel of Madgalena of Milladoiro/Photograph by Xoán A. Soler This location of rapid growth, which walkers do not enter directly but rather border its left side, it is one of the main urban centers in the council of Ames. An obligatory passing place for pilgrims on the Portuguese route, who reach Padrón and enter the municipalities of Raíces and Agrela. 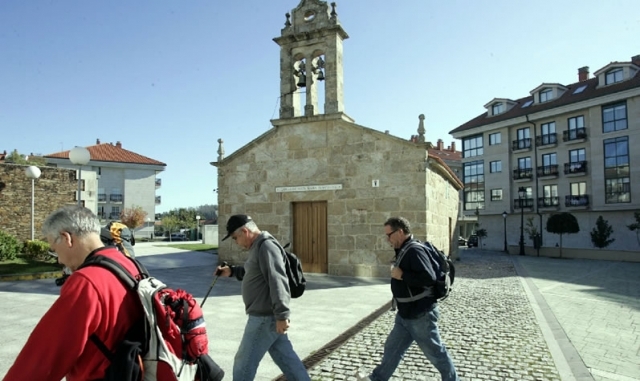 The exact point from which pilgrims deviate, for the first time, from the Cathedral of Santiago is at Agro dos Mosteiros, situated next to the electric center, at the exit of the village.. If you are traveling on the Camino de Santiago or are planning to do so soon, you should know that the distance separating Milladoiro from Santiago de Compostela is 6 kilometers.